By participating in this course, you will earn 21 Professional Development Hours (PDH), 2.1 Continuing Education Units (CEU) or 21 AIA Learning Units (LU/HSW). Whether it’s a recording studio, music performing arts center, an experimental research laboratory, a commercial office environment, or a hospitality space, proper acoustics is critically important. Mechanical and electronic vibration from support equipment must be anticipated and mitigated to avoid unwanted disturbances in those spaces. System noise and vibration can be a seen as a problem during commissioning or the operation of a facility, long after it can be effectively addressed. If you can detect these problems during the design phase, you’ll improve timeliness, financial efficiency, and ultimately the success of a construction or renovation project. This course will help you understand noise control and offer solutions to both common problems as well as the unique situations you may encounter. Learn how to measure and evaluate the effects of acoustics and vibration to achieve the required criteria and incorporate the appropriate design and construction details. Increase your understanding of noise criteria, octave band, measuring protocol and isolation methods. 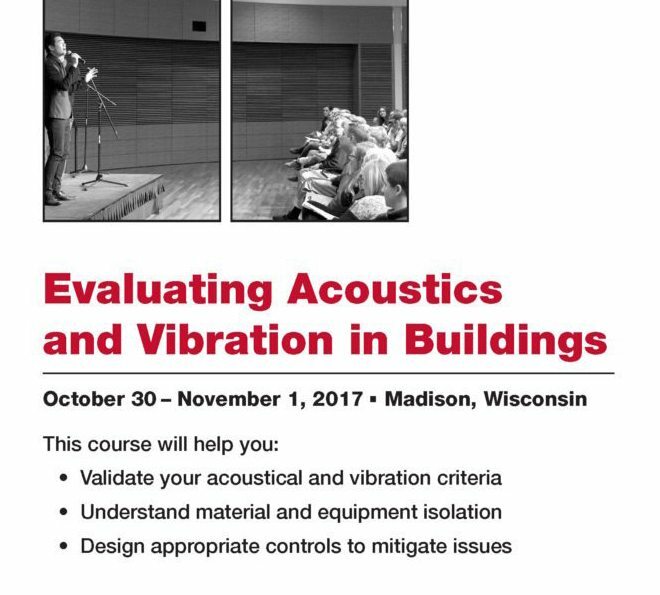 Instructors in the course include practicing designers and acousticians, and industry experts in vibration isolation. The classroom lectures and discussion will be supplemented by a preview of the new performing arts center under construction on the UW–Madison campus.